Are You Married To Your Dental Practice? Find the right match. This sounds cliché, and it sounds obvious. But, the allure of surface level qualities can blind anyone. You must spend some time with the person and the practice before making a solid commitment. In business, this is called the due diligence phase. You find something or someone you are interested in, and then you have some time to check out if there is validity in the outward, observed appearances. For a practice, you have to ask, “Do these numbers really make sense? Can I see as many patients in a day like the current owner? Do I want to see that many patients? Is the low collection rate due to an employee deficiency? Does this location offer future growth opportunities?” Many, many questions need to be asked, and good answers need to be offered to justify a long term commitment. After all, this decision will significantly affect your financial wellbeing for the next several years. When it comes to long term relationship issues, completing due diligence is also necessary. After seventeen years with my husband, I can truly say this decision will significantly affect your personal health and wellbeing for the future. A spouse that says he or she is supportive, but shows no action in helping to foster your professional goals probably won’t change in the future. Spend the needed time to know this person extremely well before signing on the dotted marriage line. No relationship is perfect, but to last a long, long time, it should be fairly perfect. Put in the time. Maintaining a business or a relationship is hard work. There are very few short cuts. You simply have to make the time and prioritize your schedule if you want your business and relationships to last. Sometimes it will feel like you spend too much time at work, and then sometimes it will feel like you need to get back to work. When I first started my practice, I definitely felt like I was spending more time at my office than at my home. Contrarily, during my second child’s maternity leave, I felt like I wanted to return to my professional role even though I loved my “Mom” role. Although some people lead a very balanced lifestyle between work and home, I found this hard to achieve. I end up balanced, but only after realizing I am neglecting one area or the other. I balance it out; I get better at seeing the imbalance earlier now, and try to foresee trouble before it starts. Regardless, relationships at home and at work need to be nurtured. It is our choice to add people to our homes (with children) and to our work. More children or more employees do not mean we can neglect one side or the other. It may mean we need to be more efficient or acquire different systems to guarantee quality time is available for work life and home life. The two people with the most needs will be your spouse/partner and your office manager. Give both a lot of time. They will help you the most in your thinly stretched moments. And, if you lose one or the other of them, the results will affect your home team or your work team the most. Expect ups and downs. I know the field of dentistry is filled with perfectionists. Dentists like the adrenaline rush of a completed case or a satisfied patient. Dentists are do-ers and helpers. Dentists are used to being successful. When life delivers unexpected news or difficult patients, we have to learn to deal with adversity and failure. I recently spoke to first year dental students at the University of Detroit Mercy School of Dentistry, and I told them about the “R & R” strategy. You might think I mean rest and relaxation when you hear “R&R,” but, in addition to rest and relaxation, I also believe people need to reflect and relinquish in times of distress. After failing in a situation, take some time to reflect on what went wrong. What role did your behavior play in the problem? What could you have done differently to gain a better result? Then, once you have taken time to analyze the problems and implement new ways of thinking or new ways of acting, let go of the problem. Relinquish it. If you dwell on the issues, more problems will likely surface, and you will miss the next opportunity to do things differently. Learn to communicate effectively. No one is a mind reader. Honest feedback is the only way you will grow old together. Otherwise, one person will interpret words or gestures differently than you, and without honest, open communication, feelings will be hurt over and over again. Take the time to talk through disagreements and bottlenecks. For a marriage, try to discuss situations nightly. Going to bed angry is highly discouraged. For team members, make a list of problematic issues, and have regular team meetings to honor the time needed for these important trouble spots. Without regular communication, it is too easy to grow apart. If you committed to a practice or committed to a marriage, you owe it to the people involved to share your opinions and feelings. And, you will serve your work team and home team well if you listen to their needs and wants. Celebrate the big and little moments. It is way too easy to take people for granted. Our partners often receive the worst outcomes from this bad habit. It takes an intentional effort to thank our spouses and our employees for being there with us and for us. Therefore, when someone improves our lives in the biggest or smallest ways, we must recognize their efforts. A simple, “thank you for helping me today” can mean a lot to the giver of time to you. We all give to others because it makes us feel good to help someone. It is an added energy burst when someone actually recognizes the small gifts we give them. Allow the other person to feel that double energy burst. And, when big moments come along, like anniversaries or birthdays, recognize them with meaningful gifts or words of appreciation. Know your spouse enough to get him or her what they want. Know your team members enough to get them what they want. If you are at a loss for ideas, ask them. Each of us likes to be appreciated differently. We must notice one another and act accordingly. It’s very tempting to get someone what we would like; it’s much more difficult to get them what they would like. Laugh. We need the endorphin release. There is so much science behind the healing effects of laughter. If we are serious all of the time, we miss opportunities to relieve stress. When choosing that special person in your life, maybe even a life partner, consider their sense of humor. Do they laugh when you laugh? Do they laugh at your jokes? Do you like their sense of humor? Do they make fun of others in a way that is not humorous to you? When choosing a team member, do they make any jokes? Do you find the same things offensive or not funny? Do you feel like you can be yourself around them? Are they willing to laugh at themselves? Are you willing to laugh at yourself? We spend a great deal of time in serious, tense situations; we must find time to balance this out with our teams and with our partners. Talk about money. Money is difficult for people to talk about, yet it accounts for so much joy or misery in a marriage or in a practice. Dentists often squirm when trying to express their desires of wealth to their teams. When done well, teams know what to expect and learn how to earn more money to meet everyones’ goals and desires. When done poorly, dentists come across as money hungry mongrels or aloof money managers. For spouses, a general sense of how much money comes in and how much goes out is needed to help create a relationship based on trust and personal responsibility. Budgets help achieve long term goals and provide guidelines for expected spending habits. Create budgets together and adhere to them. 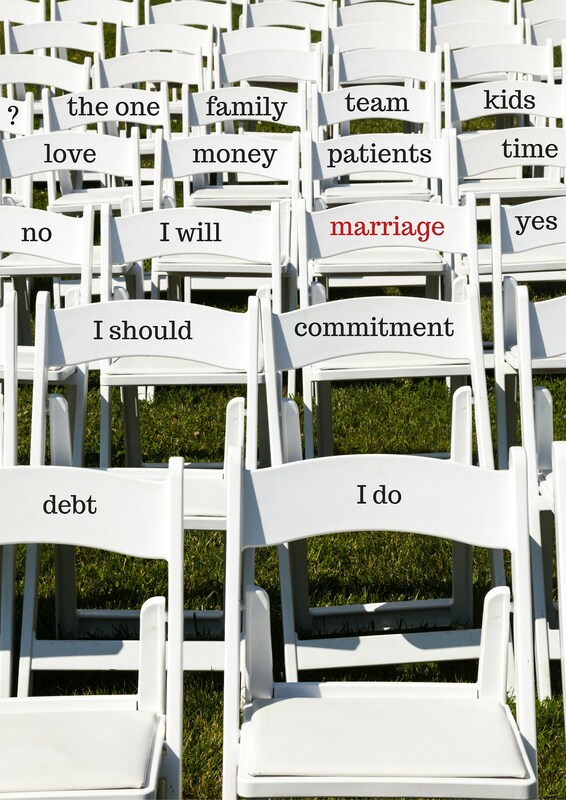 As you marry your loved one or marry your beloved practice, you are committing to others. It may seem like you are giving all day to your patients, and there is little time left for others around you. You may feel tempted to take your partner or employees for granted because you give much of your daily attention to patients; resist this temptation. Be intentional. Find the strength to give love and attention to your spouse and to your employees. Find time on your day off, or make time at the beginning of the day when you are the most revived to make it happen. It will be their love and attention that carries you through the rough times. Dr. Lisa Knowles encourages an intentional lifestyle and provides valuable insight to dental professionals through her speaking and writing talents at IntentionalDental Consulting. To schedule Dr. Knowles for your educational and inspirational speaking needs, contact her at 517-331-3688, or email her at IntentionalDental@gmail.com to request her speaking packet. She also provides one-on-one professional coaching for dentists. Dr. Knowles speaks on these topics: Beyond 32 Teeth–The Mouth As a Health Indicator, Eco-Friendly Dentistry, Communication Continuity, & Team Leadership Development. Her website is IntentionalDental.com.